The increasing popularity of Astaxanthin has naturally led people to ask questions like – ‘is it safe?' Or, ‘are there any long lasting side effects associated with the use of astaxanthin?' It is only practical to ensure that substance is safe before starting to use it as a supplement on a daily basis. What is not realized is that most people have encountered or even consumed astaxanthin unknowingly. Astaxanthin is a naturally occurring carotenoid typically found in marine settings, especially in organisms like trout, krill and micro-algae, and it is an important component in a variety of food-chains. The micro-algae haematococcuspluvialis is thought to be the richest source of the compound. The bright pink color seen in the skin of a salmon is due to ingestion of astaxanthin. At birth the flamingo is a white bird, but a diet of carotenoid algae and other sea life like shrimp, or prawns, which consume the astaxanthin packed algae, give flamingos their vivid pink coloration. In nature, astaxanthin shows up as sharp and colored pigmentation, but in the human body it works as a powerful antioxidant that in some ways is similar to the well recognized beta-carotene. Astaxanthin is frequently added to farmed animal feed as it adds pigment to crabs, shrimp, salmon and lobsters, giving them the color they get by feeding in the wild. 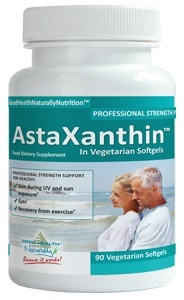 Astaxanthin is considered safe as an animal supplement. Furthermore, FDA in the United States, have cleared astaxanthin as a food additive, fit for human consumption. The most commonly occurring side effect is the harmless change in pigmentation. With a high dosage of astaxanthin, stool's turning orangey-red, or the presence of an orange tint to the skin might be observed in some people. But, NO toxic effects have been observed, even when very high doses were consumed by animals or humans. Other very rare side effects of astaxanthin that have been reported include hair growth, alterations in hormone levels, allergic reactions, decrease in calcium levels in the body and low blood pressure. Drug interactions are a possibility for people who are on mediation and also using astaxanthin. For instance, using it while on blood pressure medication, it can dangerously boost the effects of the mediation, causing blood pressure to drop seriously low. Important: If you are using blood pressure medication, do not use, or at least consult your doctor before taking any amount of astaxanthin. Similar issues can arise with antihistamines and asthma medications. Astaxanthin can also affect liver enzymes by hindering the removal of a variety of compounds from blood, leading to elevated levels of the drugs circulating in the body. Because the benefits of astaxanthin seriously out way any potential side effects, which are (usually) only caused when someone has not followed the golden rules of never taking a natural blood thinner, when they are already taking a prescribed anticoagulant. Astaxanthin offers many positives to health, which should not be over looked – like improving cognitive function of the brain, helping to relieve joint pain and reducing cholesterol, to name just a few. Although the more serious side effects are rare, they can occur and for anyone thinking of using astaxanthin as a supplement should be aware of these potential rarities, particularly using in conjunction with pharmaceuticals or if you have certain allergies. 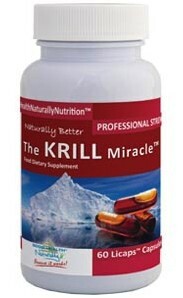 This allows one to make better use of this wonderful supplement, without causing any unpleasant incidents. For example if you know you are allergic to seafood, then there is a good possibility that you may be allergic to astaxanthin, and it would therefore be be wise to proceed with caution. Loved your article. I had no idea what Astaxantin was or its benefits and side effect until I came across your article. Thank you for educating me. I would love to continue to read you every time you write something. Thank you for your input Yanira, I appreciate your time.